These are the first official pictures of the new 2010 BMW X3. At first glance, it's a shrunken X5 and looks smarter and larger than the outgoing, first-generation X3 which never quite lived up to its promise. It's all change with the new X3 in more ways than one. The new 2010 SUV will be built by BMW in Spartanburg, South Carolina, USA, and not by Magna in Graz, Austria. That should help fix the quality glitches that blighted the original X3. There's a squarer aesthetic at play here. Just check out the horizontal lines marking out the front lights – and a long character line along the flanks further distinguishes X3 from X5. The new X3 is bigger than before, but now the latest X5 has swollen to accommodate three rows of seats, there remains clear water between BM's two large SUVs. Munich says the new X3 has the lowest emissions of any 4wd model in this segment. Very zeitgeisty. How have they achieved low CO2? By fitting stop-start and an eight-speed transmission to lower the revs. But this is a BMW, so there's plenty on offer for enthusiastic drivers. All X3s are four-wheel drive and have multi-link rear suspension tuned for fun as well as pampering, according to its maker. They'll have to make the fully electric power steering perform though; feel can often be lacking in such systems. Variable Damper Control is available on the new X3 for the first time, letting drivers pick between Normal, Sport and Sport+ settings to tweak damping, steering assistance, throttle response, stability control thresholds and speed of gearchanges. Is the new X3 better inside? CAR's sat in the new X3 and can report that the quality of materials and build quality do seem better than the outgoing model, whose finish never quite matched the rest of the BMW range. The centre console is angled towards the driver, there's iDrive, a 6.5in digital display as standard or an 8.8in monitor if you upgrade to the fancier sat-nav. 'The largest on-board monitor in its segment,' trumpets BMW. If size is your thing, you'll be pleased to know that the new X3 offers more accommodation in every direction, according to Munich. The boot stands at an echoing 550 litres as standard and expands to 1600 litres if you swing the back seats down. Naturally, the full might of the BMW tech department has been thrown at the new X3. You can order head-up displays, online connectivity, three individual rear seats which all fold individually, hard-disc entertainment systems and a panoramic 360deg parking camera like Nissan's. 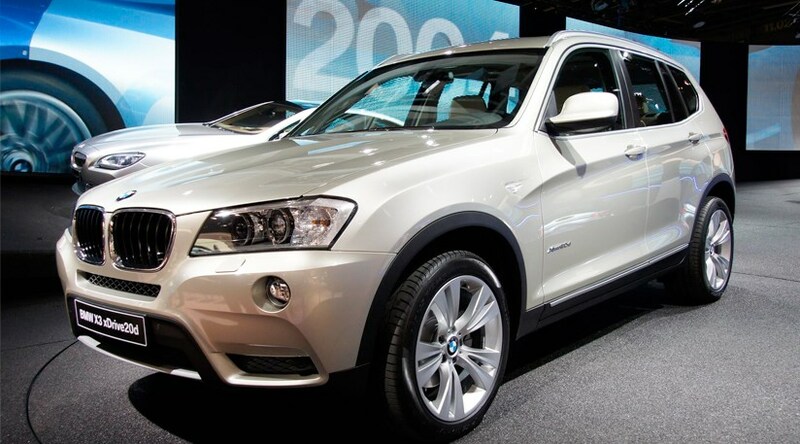 The big seller – hogging 80% of sales – will be the X3 xDrive20d. It has a 2.0-litre aluminium four-cylinder, mustering 182bhp and 280lb ft from 1750-2750rpm – enough for 0-62mph in 8.5sec and 130mph. Yet thanks to stop-start, CO2 stands at 149g/km and average economy 50.4mpg. BMW has beaten Land Rover to market with a stop-start auto; the eight-speed 2.0d is actually marginally cleaner, at 147g/km of CO2. All other figures are identical to the manual listed above. Other engines will be confirmed later. This likely best-seller will cost £30,490 – £115 less than the outgoing X3. Standard equipment includes leather upholstery, twin-zone climate control.